Get 5% CC rebate when you recharge your GCoins with CC from 1 Dec 2018 to 16 Dec 2018 2359HRS (GMT+8)! 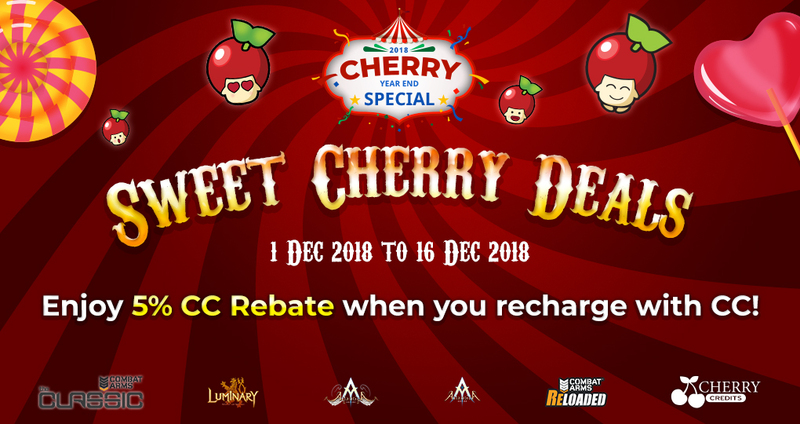 Also, not to miss other superb deals from Cherry Credits in this Cherry 2018 Year End Special! Deals include discounts, rebates and bonuses offers, top-up vouchers lucky spin, spend and sure-win lucky dip, weekend flash sales and year end lucky draw, it’s a party for everyone! Get 5% CC rebate when you recharge your GCoins with CC! Also, enjoy up to 80% discounts, rebates and bonuses for other game titles! From 17 Dec 2018 to 31 Dec 2359HRS (GMT+8), receive 1x Sure-Win Cherry Dip chance with every 10,000 CC spent in a single transaction. Prizes include jaw-dropping 500,000 CC and premium in-game prizes from your favourite games!